Eastleigh came from 2-1 down to rescue a point against 10-man Woking thanks to a late Callum Howe equaliser. 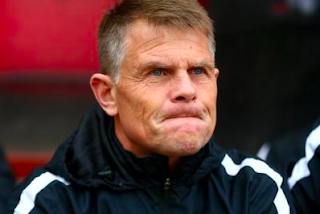 Reaction from Spitfires boss Andy Hessenthaler: “If we can’t defend as a team, we’re not going to win football matches. It’s as simple as that. “It’s down to me whether I change things, not just personnel but shape, but I’m a big believer that it’s not about shape. This is about players and taking responsibility and today I thought we didn’t take responsibility at certain times. “Our decision-making, not just today but over the season as a whole, has let us down. We’ve got to cut that out and start doing things better. “The energy levels were good again, we had a go, and the pitch was difficult. They (Woking) are a younger team than us, they’ve got energy and they changed it around a bit, so give them credit. But ultimately it’s down to us. “For the amount of experience we’ve got in that dressing room, these things shouldn’t happen. 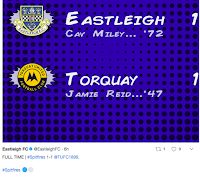 Eastleigh drew 1-1 with Torquay on Boxing Day. After a goalless first half, the visitors took the lead through a Jamie Read penalty early in the second half. Torquay were then reduced to ten men before Cav Miley equalised for the Spitfires. Eastleigh got off to a winning start under Andy Hessenthaler securing a 2-1 win at Dagenham & Redbridge. The Spitfires came back from a goal down with Chris Zebroski and Paul McCallum both on the scoresheet. Andy Hessenthaler has replaced Richard Hill as Eastleigh manager, with Hill moving to a full-time director of football role. Chief executive Mark Jewell commented: "Now seems to be a logical time to make the change. Richard brought ‘Hessy’ to the club at the start of the season. "He has a great track record, is well liked and has fitted in extremely well. It goes without saying that we have every confidence in him. "This will allow ‘Hilly’ to move full time into his role as director of football. There is a lot to do, both on and off the pitch, and I very much look forward to working with them both, in their new roles." Richard Hill: “I’ve been trying to do two roles, but I was manager and I’ll take the blame for what’s happened on the pitch. Although perhaps the biggest thing I should be blamed for is leaving the club in the first place. Eastleigh lost 2-1 at Ebbsfleet in the FA Trophy. The hosts took the lead through Danny Kedwell before the Spitfires hit back with an instant reply when Cavaghn Miley equalised. Ebbsfleet progressed in the cup though thanks to a late goal from Myles Weston. 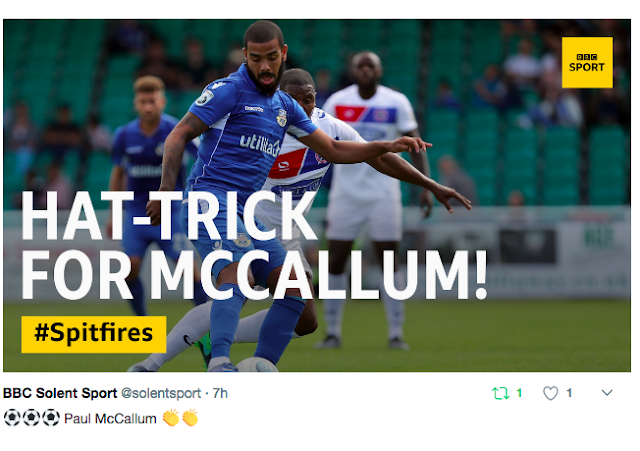 Paul McCallum bagged a hattrick for Eastleigh in a rollercoaster 4-4 draw against Bromley at the Silverlake Stadium. Richard Hill's reaction: “There’s been times when I’ve been accused of not entertaining people, but today we have – both teams. “It was one of those crazy, crazy games you get two or three times a season. “But today you’ve seen two teams that need to defend better. Most definitely my team need to defend better. “We’ve had to score four goals to draw a game of football at home. “For the first 25 minutes, we probably played as well as we have all season and there were spells in the second half when we played some decent, flowing football, but we can’t defend like that. “Brett (Williams) has come on and changed the game, but we were always going to face a bit of an onslaught from them and we didn’t handle it well enough, we really didn’t. 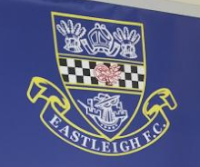 Eastleigh dropped to 19th in the table and are without a win in six league games after a 2-0 defeat at Sutton United. Former Spitfires manager Paul Doswell has taken Sutton to the top of the National League. Both goalkeepers were sent off in an extraordinary game at FC Halifax Town as Eastleigh were pegged back to a 3-3 draw. The Spitfires were 2-0 up with just 21 minutes played as Sam Matthews' corner found the back of the net to open the scoring. Chris Zebroski was on hand to double the lead from another corner that was flicked on by Andrew Boyce. Scott McManus pulled one back for the hosts from the penalty spot just before half time. After the break, Halifax were reduced to ten men when goalkeeper Sam Johnson was shown a second yellow card followed by a red. 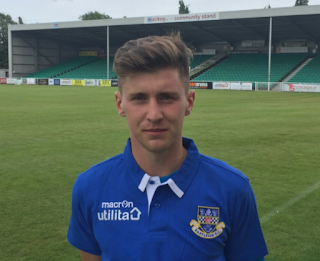 Just past the hour mark, Simon Heslop scored his first goal for Eastleigh to put the Spitfires 1-3 ahead. Tom Denton reduced the arrears for FC Halifax Town to bring them back into the game at 2-3 before Ross Flitney was then sent off for Richard Hill's side. With no keeper on the bench, defender Boyce put on the gloves and made a superb save with his feet to keep the slender lead intact. The Spitfires fought back from 2-0 down to earn a point. Ayo Obileye scored an 83rd minute penalty before Ben Williamson hit his ninth goal of the season deep into stoppage time in some style to level. Eastleigh: Stack, Hoyte, Boyce (Miley 68), Howe, Shaw; Matthews, Heslop, Obileye, Yeates (Hudson-Odoi 68), McCallum (McAllister 68) Williamson. Subs not used: Constable, Zebroski. Eastleigh have signed striker Bradley Hudson-Odoi on a two-month loan from Sutton United. Hudson-Odoi began his career at Fulham, where he was a youth team player. In 2007, he represented Ghana at u20 level. More recently, Hudson-Odoi was a key part of the Sutton United FA Cup run of last season – playing against AFC Wimbledon and Arsenal. The man himself was delighted to meet up with the squad and go straight into the squad. “I’m really excited – I got the call last week from the manager, and getting the opportunity to play for such a big club is great. The club are delighted to announce the signing of Bradley Hudson-Odoi on loan from @suttonunited - subject to the completion of National League paperwork. Eastleigh suffered another home defeat losing 2-0 at the Silverlake against Barrow, who had lost their last seven away games. EASTLEIGH: Graham Stack, Gavin Hoyte, Frazer Shaw, Cavaghn Miley (Ayo Obileye, 84), Andrew Boyce, Callum Howe, Mark Yeates, Simon Heslop, Ben Williamson, James Constable (Sam Matthews, 63), Chris Zebroski (Paul McCallum, 63). Subs (not used) : Ross Flitney, Craig McAllister. 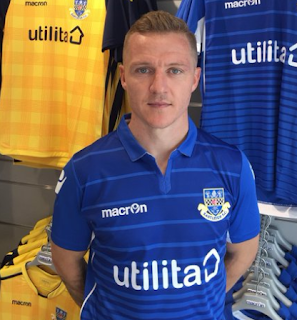 Ross Stearn has rejoined Sutton United after leaving Eastleigh by mutual consent. He leaves the Silverlake having made 31 appearances and scored five goals under three different managers since linking up with the club for an undisclosed fee. He had signed a two-and-a-half-year contract for the Spitfires and has now rejoined Sutton on a two-year deal. 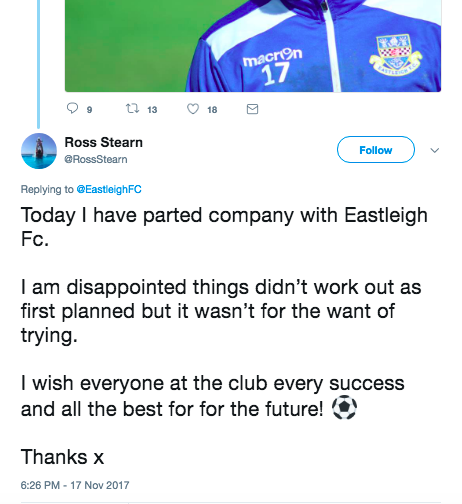 Saying his farewells to Eastleigh, Stearn admitted: “I am disappointed things didn't work out as first planned, but it wasn’t for want of trying. “I wish everyone at the club every success and all the best for the future." He added: "I had a brilliant two years at Sutton and have really missed the dressing room and supporters who were fantastic with me. "I’ve always kept a look-out for our results and the boys have done an amazing job. It really feels like I’m coming home and to put on the amber shirt again is so exciting. Simon Heslop, 30, has joined the club on a one-month loan deal from York City. He captained York to FA Trophy victory against Macclesfield at Wembley Stadium in May this year. The midfielder played against the Spitfires last season, scoring when York visited The Silverlake in November. Speaking upon arrival at the club, Heslop spoke of his delight at joining up with the squad. “I’m itching to get going – it’s only initially a one-month loan, but I’m excited to get started. Speaking about the signing of Heslop, Richard Hill said: “I did say I wouldn’t put a sticking plaster on it, but the reason I’ve been convinced is because we’ve found a midfielder who wants to prove himself at a higher level and he’s coming for the right reasons. "It’s a deal that's beneficial to both the club and player and it’s financially right as well. Goals from James Alabi and former Spitfire Connor Essam were enough for top of the table Dover to seal a 2-0 win over Eastleigh. Richard Hill's reaction: "It was a frustrating day - we're up against it at the moment. "The only players we've got at the moment are the players that are in that dressing room - and it doesn't help when a couple of decisions go against you. "At times I thought we played decent football - but we just couldn't open them up and get that opportunity." Eastleigh have signed 22-year-old full-back Frazer Shaw. Shaw joins the Spitfires after a spell with Dulwich Hamlet and began his career with Arsenal and Sunderland before making his Football League debut for Leyton Orient in 2015. He played 30 games for Orient before moving on to Accrington and Woking, and then signing for Dulwich in August. Eastleigh boss Richard Hill said “He’s come through the system at West Ham and you have to be respectful of that. “He’s another one who should probably have done better and played higher than he has. Whether that’s because he hasn’t had the right break, I don’t know. “But he was available and he’s not come here asking for shedloads of money or accommodation. 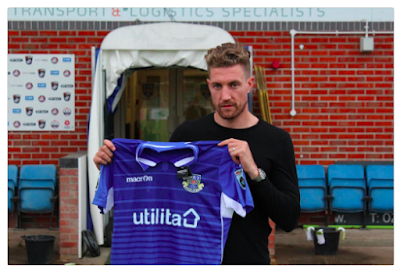 “The opportunity to play for Eastleigh means far more to him than the pound signs in his eyes and that’s refreshing. He’s young and he’s going to be hungry. “He’s a nice lad and he’s trained with us all week and taken on board what we’re trying to do." Eastleigh had to make do with a point after surrendering a two-goal cushion at home against Chester. The Spitfires scored early goals in each half through Ben Williamson and Gary McSheffrey, but visitors Chester fought back to draw level and earn a share of the points. Richard Hill: "It feels like a defeat. “It’s still a point on the board, but it should have been three. “We went 2-0 up and then just sat a bit too deep. We didn’t get hold of the football and pass it to each other and you end up aimlessly kicking it up the pitch. "That forces you into changes, getting bodies behind the ball, and you tend to invite a bit of pressure. Mark Yeates: “Speaking for all the boys, we’re gutted. “For 60 minutes we moved the ball well and I thought it was as good as we’ve played at home all season. “But how many times have we got ourselves in front and haven’t got maximum points? Two goals from Mark Yeates helped Eastleigh to an excellent away win at Macclesfield. Eastleigh crashed to a 2-1 home defeat against bottom club Solihull Moors. It was the Spitfires fourth defeat in five games. Eastleigh: Flitney, Obileye, Cresswell, Howe, Green; Constable, Hollands, Miley (Zebroski 83), McSheffrey (Yeates 61); McCallum (McAllister 70), Williamson. Subs not used: Boyce, Miley. Solihull Moors: Townsend, K Green, Bowen, Carter (c), Murombedzi, Hylton (Camwell 74), Afolayan, P Green, Daly, Asante (Brodie 70), Richards (Kettle 83). Subs not used: Bannister, Sammons. A winning goal from Ben Strevens deep into second half stoppage time saw the Spitfires claim all three points with a 3-2 win over Gateshead at the Silverlake Stadium. Richard Hill's side had been 2-0 up thanks to a fourth-minute goal from Ben Williamson and a second half strike from James Constable. Gateshead fought back to draw level with goals from Jordan Preston and Theo Vassell late in the game, but Strevens was in the right place at the right time to profit from good play by Mark Yeates to seal victory for Eastleigh. 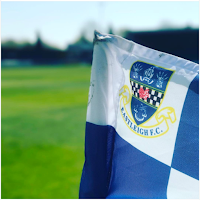 Eastleigh: Ross Flitney, Ayo Obileye, Michael Green, Danny Hollands, Ryan Cresswell, Callum Howe, Gary McSheffrey (Mark Yeates, 73), Sam Wood, Paul McCallum (Craig McAllister, 66), Ben Williamson (Ben Strevens, 83), James Constable. Subs: (not used) Chris Zebroski, Cavaghn Miley. Eastleigh crashed out of the FA Cup after losing 2-1 at home to Hereford, who are two divisions lower. The Spitfires finished the game with nine men as both Andrew Boyce and Gavin Hoyte were shown red cards. Eastleigh: Ross Flitney, Gavin Hoyte, Michael Green, Sam Togwell (James Constable, 46), Sam Wood, Mark Yeates, Ben Strevens, Craig McAllister (Paul McCallum, 74), Andrew Boyce, Ben Williamson (Gary McSheffrey 74), Callum Howe. Subs (not used): Ryan Cresswell, Chris Zebroski, Ayo Obileye, Cavaghn Miley. Wrexham scored two second half goals to wipe out Ben Williamson's first half strike for the Spitfires. Eastleigh: Ross Flitney, Gavin Hoyte, Sam Wood, Danny Hollands, Andrew Boyce, Callum Howe, Ben Strevens (Ross Stearn, 80), Craig McAllister (Cavaghn Miley, 65), Ben Williamson, Gary McSheffrey (Chris Zebroski, 71) , Mark Yeates. Subs (not used): James Constable, Ayo Obileye. Attendance 3,907 (46 from Eastleigh). A 77th minute goal from Bruno Andrade saw Eastleigh lose 1-0 away at Boreham Wood. "Following a pitch inspection from match officials, our game against Chester has been postponed. "It is with regret this decision has been made so close to kick-off. However, every care had been taken in advance of the game to prevent this from happening. "A match official was called in on Friday afternoon to view the pitch and, following this inspection, it was deemed safe to play. This information was relayed to today’s referee Mr Savvas Yianni on Friday afternoon. "Upon arriving at the ground today, the match officials have taken the view that player safety was at risk and decided to postpone the game. "Ground staff had covered the small affected area overnight to protect the surface from any rainfall which was forecast. Eastleigh came back from Hartlepool with three points after a fantastic 2-1 win thanks to second half goals from Callum Howe and Mark Yeates. The Spitfires scored both their goals in the space of four minutes after half time. 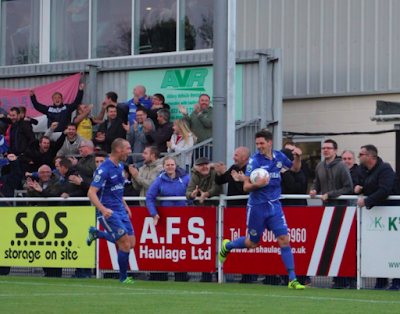 It finished 2-2 at the Silverlake Stadium as Eastleigh made it five draws in six matches. Visitors AFC Fylde hit an equaliser in each half to earn a point. Richard Hill's side opened the scoring through a Reda Johnson header in the 27th-minute, but it was cancelled out in first-half injury time when Henry Jones reacted quickly in the area to beat Graham Stack. After the break, Gary McSheffrey netted his first Eastleigh goal in the 55th minute from a great assist by Mark Yeates. Eastleigh: Stack, Howe (c) Boyce (Wood 64), Johnson, Green, Hollands, Matthews (McAllister 75), Miley, Yeates, McSheffrey (Williamson 82), Zebroski. AFC Fylde: Lynch, Montrose, Francis-Angol, Tunnicliffe, Bond, Rowe, Muldoon (McCread 82), Grand, Smith (Blinkhorn 89), Burke, Jones (Tasdemir 70). Eastleigh suffered their first home defeat of the season losing 1-0 against Maidstone United. Zavon Hines, a former Burnley and West Ham forward, scored the only goal of the game in the second half. The Spitfires are now without a win in five league games having drawn the previous four. 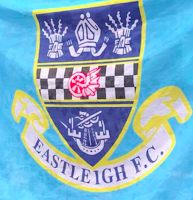 Eastleigh: Graham Stack, Ayo Obileye (Ross Stearn, 80), Michael Green, Danny Hollands, Andrew Boyce, Callum Howe, Mark Yeates (Chris Zebroski, 76), Sam Matthews, Gary McSheffrey, James Constable (Craig McAllister, 76), Cavaghn Miley. Subs: Sam Wood, Ben Strevens. 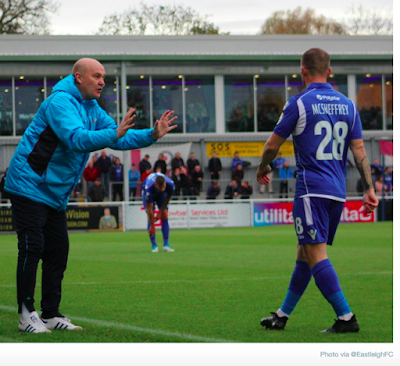 Eastleigh boss Richard Hill has given his thoughts after the 0-0 draw away at Guiseley. 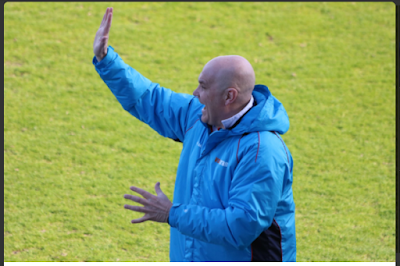 Hill said: “It was a horrible game, but credit to Guiseley. “They put you under pressure from start to finish, but I don’t think that was the case before. “It makes you think that if those players had played like that in the previous eight games (former management duo) Adam Lockwood and Dave Penney would still be in jobs, but that’s football for you. “We’d had a couple of match reports done on them prior to the game, but we ripped them up because we knew it was going to be totally different to how they played under a new manager. “Everyone will say you should go to places like that and win but, let me tell you, Guiseley haven’t played like that all season. “It’s our luck at the minute that we’ve had a tough eight games and, for the ninth, we’ve come up against ‘new manager syndrome. 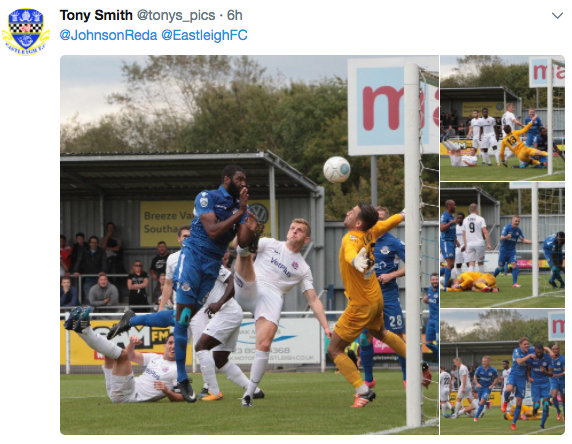 Eastleigh were held to a fourth successive draw at second-to-bottom Guiseley where it finished 0-0. The Spitfires are 12th in the table ahead of Tuesday's home game against Maidstone United. Eastleigh have signed 35-year-old Gary McSheffrey until January. "I've got a couple of friends here who have been nothing but impressed with the set-up," he told BBC Radio Solent. "It's definitely an ambitious place and hopefully we can get the club to where they want to be." “I get a lot of criticism for signing older players, but this lad is 21 and he’s been impeccable. “Brian (Little) raved about him and said to give him a chance, but I had to handle it properly. “I kept him back because of the seven games (in August) and I thought it was the right time to bring him in today. “If I’d put in him early, perhaps against Tranmere or Dagenham, it could have ruined him. “He’s a bit of a hidden player, but, if he plays like that, he won’t be for long. “I don’t want to go over the top because we’ve all seen young players have good debuts and not progress. “But it’s up to Cav now. “No disrespect to Ebbsfleet, but we were probably the better team. “We’re a different type of team this season. We were still trying to win at the end of the game, which was refreshing. Having gone ahead through a James Constable goal after 20 minutes, Eastleigh had to come back from behind to draw 2-2 at Ebbsfleet. The home side hit back with goals from Jack Powell and Danny Kedwell to edge in front. Craig McAllister came off the bench to earn the Spitfires a point with an equaliser ten minutes from time. EASTLEIGH: Graham Stack, Reda Johnson, Sam Wood, James Constable, Mark Yeates (Sam Matthews 65), Chris Zebroski (Craig McAllister 65), Ayo Obileye (Ross Stearn 73), Danny Hollands, Andrew Boyce, Cavaghn Miley, Callum Howe. Unused subs: Michael Green, Ben Strevens.